From gum disease treatment to tooth replacement to headache relief, the team at Fort Bend Periodontics and Implantology is committed to helping our patients improve their oral and overall health. Our Sugar Land dental care services are designed to help you live a headache-free life with a smile that is healthy and beautiful. Your gums are an important part of your mouth, so keeping them healthy is key to your oral health. If you have any stage of gingivitis, gum recession, or other issues with your gums that are causing you dental problems, Dr. Bret Dyer and his team can help improve your periodontal health through deep cleanings, antibiotics, and even laser dentistry. In the early stages of gum disease, called gingivitis, we can often use conservative, non-invasive treatments to remove the plaque and tartar that is below the gum line. This is essential to ridding the gums of disease. A deep cleaning called “scaling and root planing” uses special tools to clean under the gums, where normal dental tools can’t reach. Once this area is clean, the gums can reattach to the teeth and begin to heal. Periodontal maintenance appointments are essential after a scaling and root planing to help keep the plaque and tartar around the gums and roots of teeth at a minimum, so we’ll develop a schedule that meet your unique needs. We also offer treatment using the Perio Tray® by Perio Protect. If a bacterial infection has caused your gum disease, you can use the Perio Tray to apply medication directly to and under the gums to fight off the infection. Tissue damage that is extensive, or gum disease that has advanced to the periodontitis stage, may require surgical treatment. When you come in for a consultation, we’ll assess your needs and make a recommendation that is right for your current dental health. Our soft and hard tissue lasers are used to repair and regrow gum tissue. We can use laser new attachment treatment in early to moderate stage gum disease to remove infection through a minimally invasive procedure. This allows the gum tissue to reattach to teeth and close the gap caused by the infection. Other surgical periodontal treatments include tissue regeneration where we remove the infection using laser treatment, and then add proteins to the area to stimulate bone regrowth. A soft tissue graft can correct gum recession, where the roots of teeth have been exposed, by grafting new tissue to cover the roots and using growth factors to repair or reverse the recession. Dealing with pain from chronic headaches, migraines, or TMD can leave you feeling like you’re not living a full life. If your pain is nagging, debilitating, or even keeping you from daily activities like work, let our team help relieve your pain and get you back to enjoying life again. If you get regular migraines or tension headaches, your oral health could be to blame. Dr. Dyer and his team can evaluate your symptoms, assess your jaw and other mouth structures, and determine if something like an oral appliance could help improve or even eliminate your pain. Visit us for a consultation to learn more and get one step closer to a headache-free life. The temporomandibular joint is located on either side of the jaw. TMJ disorders, often called TMD, can cause pain in this joint. Pain and/or tenderness in the jaw, aching pain in or around the ear, difficulty with or pain when chewing, locking of the jaw, and even a loud clicking when opening your mouth can all indicate TMD. If our team determines that you have a TMJ disorder, we can use anti-inflammatories, a mouthguard, physical therapy, or minimally invasive surgical techniques to help correct the issue and relieve your pain. TruDenta treatments are used for headaches or migraines, facial or jaw pain, TMJ/TMD, or other recurring pain in the neck or head area. Our team will do a physical exam and take computerized measurements to analyze the forces exerted on your mouth or jaw to determine if TruDenta is right for you. If it is, we will design a personalized plan that involves painless drug- and needle-free treatment performed in our office to correct and balance the forces and relieve your pain. The cause of TMJ pain often differs for each patient, making TMJ/TMD treatments vary on a case-by-case basis. The most common triggers of TMJ pain include damage to the teeth or jaw, arthritis, poor posture, grinding your teeth at night (bruxism), or a misaligned bite. Our team will assess what’s causing your symptoms and create a treatment plan to target those triggers. What is the post-op care like after receiving a TruDenta® procedure? TruDenta is used for both TMD and TMJ treatment. With this method, there is no true “procedure”. Each plan is customized to meet your specific needs and incorporates a unique mixture of needle-free diagnostic tools to provide you with TMD and TMJ relief. Specific aftercare instructions and timelines will vary depending on your body’s reception to treatment. 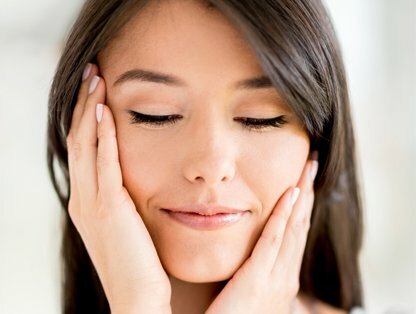 How can I prevent TMJ pain? While TMJ/TMD flare-ups are not always preventable, there are a few things you can do to minimize your pain. Wear a nightguard while you sleep to avoid teeth grinding, chew with both sides of your mouth regularly, refrain from chewing gum too frequently, and practice good posture. Additionally, it is beneficial to massage your jaw, cheeks, and temples on a regular basis. We know that many of our patients suffer from dental anxiety, and that can be heightened simply by needing to see a specialist instead of their normal dentist. We want to help everyone feel relaxed in the dental chair, so we offer a variety of sedation options to keep the nerves at bay. From nitrous oxide (“laughing gas”) to oral conscious sedation to IV sedation, we can help patients with all levels of dental anxiety feel at ease, letting us work more quickly and efficiently. If you have concerns about receiving treatment and want to learn more about how sedation dentistry can help you, speak with any of our friendly team members.